It is the street where Guan Lifen works, but young Liu Qiuming’s attraction to Forest Lane is still a lot like the old Lerner & Loewe standard. However, this side street is mysteriously invisible to GPS systems. Infatuation will lure him back to Forest Lane, but it will also bring him to the attention of China’s security and surveillance apparatus. 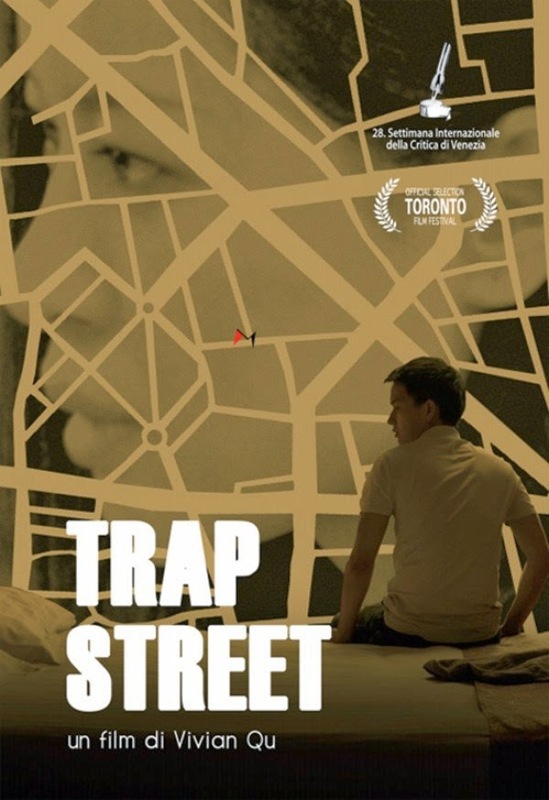 That will not be a happy turn of events in Vivian Qu’s Trap Street (clip here), which screens during this year’s New Directors/New Films, co-presented by the Film Society of Lincoln Center and MoMA. Liu has had some bad luck, but he is chipping away at his debts through his jobs as a digital surveyor and a surveillance system installer (and sweeper on the side). Then he saw Guan Lifen walking along Forest Lane. Much to his delight and his older partner’s displeasure, they must redo the sleepy side street the next day, because the system disallowed their data. Liu’s lingering pays off with the opportunity to give Guan a lift home. Better still, the business card holder she left in the back seat gives him an excuse to contact her again. Unfortunately, it will be her condescendingly gracious boss who comes to retrieve it. Of course, Liu is not ready to abandon his strategy of loitering on Forest Lane. For a while, it appears his efforts might bear fruit, until things go very wrong indeed. Small fries like Liu simply are not equipped to defend themselves when the state lowers the Kafkaesque boom. Frankly, he lacks the sufficient confidence or vocabulary to even protest his situation. Right off the bat, Trap earns points for not indulging in clichéd as-seen-through the grainy black-and-white CCTV lens sequences. In fact, the surveillance and paranoia motifs are introduced relatively slowly and subtly. Likewise, Liu’s history of victimization extends beyond his immediate problems with the secret police, giving the film even wider significance. Like many independent Chinese films, Trap does not exactly move at the speed of the Shanghai Stock Exchange, but there is quiet power in the scenes shared by Liu and Guan. Lü Yulai (looking maybe two thirds of his youthful thirty one years) and He Wenchao (a filmmaker in her own right) develop some genuine screen chemistry together, while the latter still maintains an alluring air of mystery. Even if you consider them a guileless patsy and his femme fatale, nearly every viewer will get pulled into their predicaments. Previously known as an indy producer, Qu shows an impressive command of mood and tension in her feature directorial debut. Granted, the epilogue might be too ambiguous for its own good, but Trap still offers up a compelling mixture of intrigue and social criticism, all of which cinematographers Tian Li and Matthieu Laclau give an appropriately noir luster. Highly recommended for China watchers and discerning cineastes, Trap Street screens tomorrow (3/28) at the Walter Reade and Saturday (3/29) at MoMA, as part of the 2014 edition of New Directors/New Films.